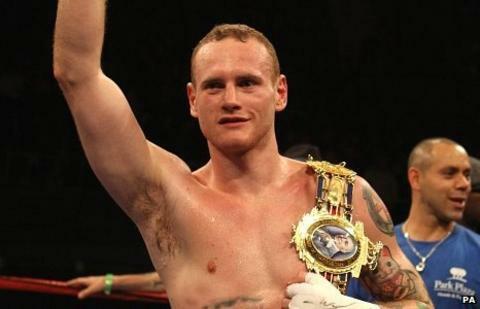 George Groves has withdrawn from his British and Commonwealth super-middleweight title defence fight after sustaining a hand injury in training. The 23-year-old, whose opponent had yet to be named, was set to joint-headline a card alongside rival James DeGale at the Liverpool Echo Arena on 9 December. "I'm really gutted as I was coming along nicely in training," said Hammersmith fighter Groves. "The injury is a setback as I wanted to end the year with four good wins." He added: "I'm sorry that my fans won't be able to see me in action, but I'll be back early next year and ready to kick off 2012 with a bang as I continue towards further titles." Earlier this month, Groves defended his British and Commonwealth titles with a stunning second-round knockout of Paul Smith at Wembley Arena. The victory extended his unbeaten record to 14 wins, which included a memorable win over DeGale. However, Groves insisted he is not ready for a world title shot despite his impressive performance against Smith. Promoter Frank Warren added: "It's disappointing for everyone concerned, but George can't fight if his hand is injured and if he did go ahead and put in a sub-par performance we don't want to make excuses. "He'll have a good rest and treatment and I'll look to get him back out early next year which will be a big one for him. DeGale's defence of the WBO Intercontinental title against Jose Maria Guerrero will now top the bill and a further title fight could be added. Unbeaten prospects Billy Joe Saunders and Callum Johnson are also on the card along with the professional debut of Damon Jones.